At our dental practice, we are proud that we can give those with celiac disease or gluten sensitivity a gluten free dental experience! Drs. Nicholas and Carla Calcaterra as well as our wonderful dental hygienists have extensive experience providing dental care for those wishing to avoid exposure to gluten. We were the first dental practice in Orange to publicly offer a gluten free visit. Dr. Nicholas Calcaterra stays current on the impact of celiac disease on oral health and has built a following of patients in Orange and the Greater New Haven, CT area who seek him out for his expertise. You may read his most recent blog post on the latest researching regarding dental findings in patients with celiac disease as well as another one on xanthan gum and celiac patients. 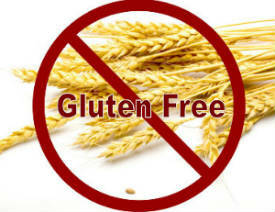 We welcome any and all patients with celiac disease or gluten intolerance. We have found over the years that many patients with celiac disease do a perfect job in avoiding gluten in their diet but then become exposed at their dentist’s office. This results in an unfortunate situation for all parties. So in what dental products can gluten commonly be found? Prophy Paste. Prophy paste is the toothpaste-like material that our hygienists use to polish your teeth near the end of your cleaning. Many prophy pastes contain gluten. 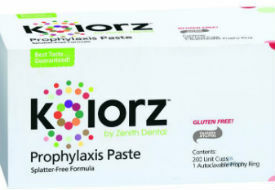 We have available gluten free prophy paste (link to the manufacturers site is here). Or alternatively we can polish your teeth instead with a light pumice. Topical Fluoride. Topical fluoride is used on kids as well as certain adults to strengthen teeth and to reduce the likelihood of dental decay. Unfortunately, certain formulations contain gluten. We have formulations that are gluten free should you or your children need topical fluoride. Topical Anesthesia. Topical anesthesia, also known as “numbing jelly,” is used to numb the gum tissue prior to the administration of local anesthesia. Some brands contain gluten. Drs. Nicholas or Carla Calcaterra can use a brand that does not contain gluten or it can skipped altogether. Polishing Paste. Polishing paste is used to polish white filings or is relied on during certain cosmetic procedures such as bonding. We have many gluten-free alternatives to polishing pastes that will get your teeth shiny and polished. Toothpaste. Many of the store bought brands contain gluten. You should ALWAYS check the label when purchasing toothpaste. The majority of the toothpastes from Tom’s of Maine are gluten free. Want to learn what goes into a gluten free filling? Learn about it here. An entire team – from the dentists to the front desk – who understands your need to be vigilant regarding gluten exposure. A cleaning from one of our hygienists with absolutely no products containing gluten. If dental procedures are needed (fillings, crowns, etc. ), Drs. Nicholas or Carla Calcaterra will review the procedure with you, the necessary materials, and ensure that no products containing gluten will be used. If you wish to make an appointment, please call us or visit this page, and be sure to identify yourself as desiring a gluten free dental visit.